There’s nothing like luxuriating in a full-on sunbeam to fulfill the cliche of a Saturday’s brunch soiree. 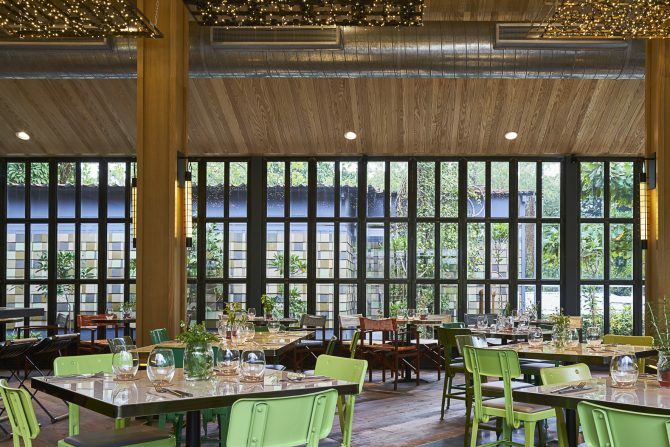 Thanks be its facade of floor-to-ceiling glass-paned windows, Open Farm Community paints an Instagrammer’s dream brunch destination – cosy, airy space that lets the light in to anoint whatever delights that lay on its glass-top rustic tables. 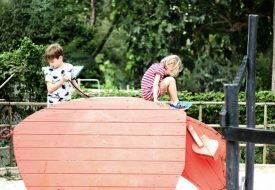 Outside, there is plenty of garden space, including an alfresco terrace bedecked with cushy furniture and a ping pong table. Aside from the flurry of weekend activities such as pop-up farmers’ markets, Open Farm Community’s stability doesn’t just depend on looks alone, but also the delicious output that has long warmed the hearts of frequent dinners. Not straying from the previous ‘farm-to-the-table’ concept, the restaurant has now placed focus on championing the locavore movement with the newest addition of power couple of Head chef Oliver Truesdale-Jutras and Sous chef Phoebe Oviedo. The free-spirited duo mirrors the OFC’s culinary ethos, which is truly a match made in heaven for the restaurant’s refreshed culinary foray. 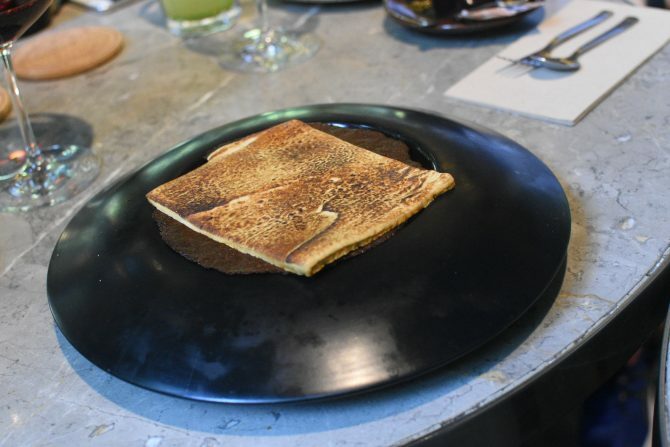 While OFC describes its updated menu as “local flavours reinterpreted for global palates”, you won’t necessarily find that claim in all of the dishes. Locally sourced ingredients? Yes. Reinterpreted local flavours? Not so much. But still, we appreciate the lineup of appetisers to kick-start out locavore meal, featuring the Citrus Cured Hamachi ($20) that opens up the palate with the harmonious zest from OFC’s garden-harvested pickled ginger blossoms, green papaya and pomelo, alongside that Fried Cauliflower ‘Wings’ ($16) that is essentially an impostor of the irresistible Korean fried chicken. If we had to order the Organic Asparagus Salad ($18), we’d do so just for the measly wad of vegan-approved cashew cheese. 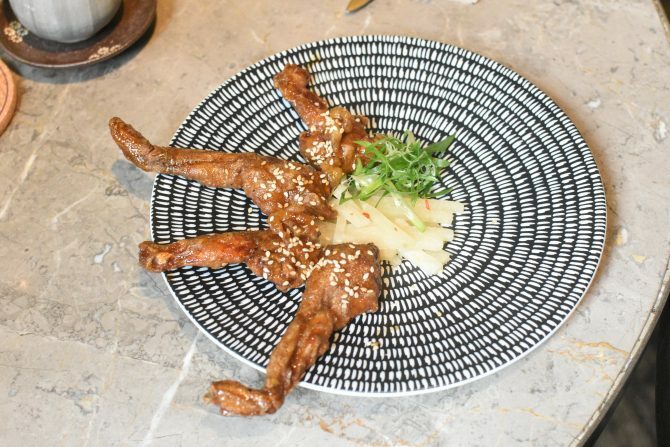 For those only settling on just one appetiser, you can’t go wrong with General Tao’s Toad Legs ($17) – a dish that most distinctly represents its aforementioned direction. Sourced from Jurong Frog Farm, the beefy toad legs are fried to perfection before caramelized with sweet homemade Kung Pao sauce. Speaking of true representation, OFC’s pasta dishes display more assertion in the theme of reinterpreting local flavours. Topped with crispy soft shell tempura, Prawn Laska Pappardelle ($28) undoubtedly holds the most local appeal, where you’ll find the usual laska suspects of curry leaves, prawns and coconut milk for a profile that coats every strand of Italian pasta. The Kin Yan Mushroom Strozzapreti ($27), on the other hand, offers a more interesting take on local flavours. 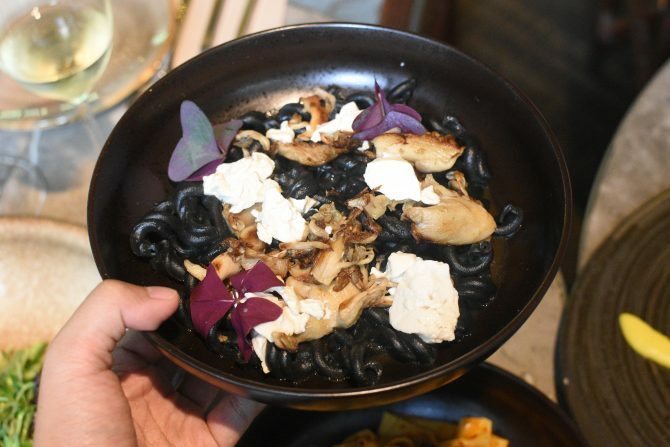 Almost similar to the midnight blackness of squid ink pasta, the strozzapreti sports a gorgeous dark grey hue from being made from fermented black beans, sourced from a Malaysian farm Zenxin Organics. Adorned with smoked silken tofu and sorrel, the black bean pasta yields a chewier texture that, paired with the beans’ innate earthy flavours, is almost like nibbling through earth. 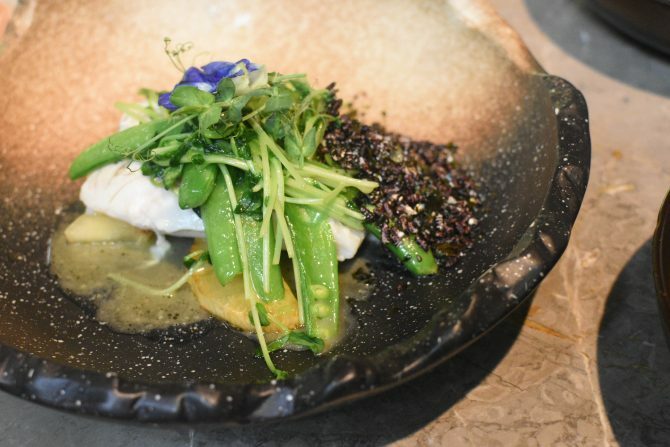 If you’re worry about carbo-loading, you can opt for Steamed Tiberias Barramundi Fillet ($30) that is steamed in dashi butter and seasoned with furikake of local seaweed and wild rice. 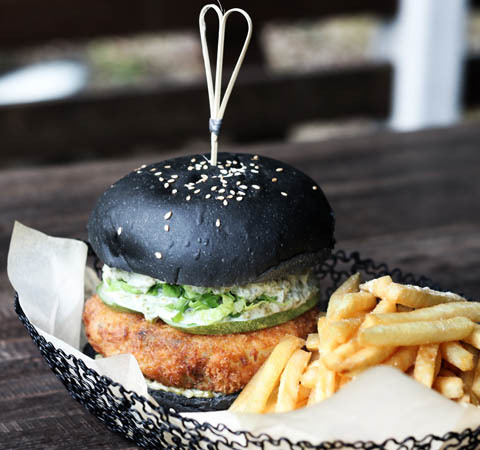 A good point to note is that the fish is caught from Tiberias, the North Eastern Coast of Pulau Ubin, before delivered within six hours to certify optimal freshness. OFC ends the meal on a good note with its trio of Lime in Coconut ($16), Thai Milk Tea Tart ($16) and Singa’Smore ($16). While the tart is only middling, the Lime in Coconut and Singa’Smore delivers with contrasting profiles to suit differing dessert-eaters. The former offers up a refreshing, light conclusion with its zesty kaffir lime sorbet that pairs with pandan and coconut meringue, while the latter proves more indulgent with its marshmallow cream-glazed banana mousse base, covered by a thick ginger biscuit. While late to the party, OFC finally offers a selection of natural wines, which you can choose under the guidance of a dedicated sommelier. We say cheers to that!